The 2015 Rugby World Cup will still be a vibrant festival of rugby despite the decision to axe Welford Road as a venue, the tournament's chief operating officer Ross Young has vowed. 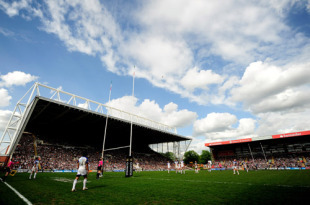 England Rugby 2015 have come under fire for scrapping plans to stage matches at Leicester's historic ground, the biggest club rugby stadium in the country. Jon Ashworth, the MP for Leicester South, raised the issue in the House of Commons on Thursday, describing the decision as "absolutely ridiculous". Gloucester's Kingsholm is the only Aviva Premiership stadium on a list of 17 potential venues, 12 of which belong to football clubs in the Premier League or Football League. But Young, who has worked for the International Rugby Board at the last three World Cups, pointed to the atmosphere generated in French football stadia during the 2007 tournament. And he insisted the same would happen in England. "We have to make sure that rugby fans will get a proper rugby experience," Young said. "France is a good example. All the venues in France during the pool phase were football venues. It felt like a rugby event and hopefully we will be able to serve beer in England, which will make it even more like a rugby event! "There were challenges in France but people still felt part of it. People said the French were fickle and they would never turn up for USA-Tonga but they did. There were average gates in excess of 43,000. If it is not a rugby experience then we have failed. We have certainly got to do that." Welford Road, Leicester's home for 120 years, had been included as a venue in England's successful bid to host the World Cup and was lined up to host two midweek pool matches. But the 24,000-capacity stadium was ultimately rejected because its pitch size and facilities failed to meet the hosting standards laid down by Rugby World Cup Ltd.
Leicester chairman Peter Tom reacted angrily, arguing that Welford Road deserved its place at the World Cup because of the club's contribution to English rugby. Young countered: "It is the same as saying 'wouldn't it have been nice to have the Olympics at Crystal Palace? "There is always an emotional aspect to it but if we are to provide a platform for the best in the world, the romance has to move away (from the decision). Rugby is an elite sport and for the last two tournaments the hosts have been set a number of minimum criteria. "We have taken on board feedback from team managers and that goes through to floodlight lux levels, anti-doping facilities, changing room sizes, pitch sizes. If you couldn't meet any or one of the sporting criteria, you wouldn't go on to the next stage. Unfortunately, where Welford Rd was concerned, from those strict policies it was impossible to fit that into the current configuration." There will be two standard pitch sizes in place for the World Cup and Young explained that even the smaller of those configurations - 95 metres by 68 metres - would not fit into Welford Road without removing three rows of seats. The evaluation committee also decided Welford Road did not meet the minimum requirements with regards to changing rooms, anti-doping, broadcast and media facilities. One source familiar with England's successful bid believes RWC Ltd unfairly moved the goalposts on Leicester, arguing that pitch size was never raised as an issue during the bid process. "After the bid was submitted, the IRB then carried out a comparative analysis with all the other bids and came back on a number of areas requiring clarification and additional detail," the source told Press Association Sport. "Pitch size was not one of them. The bid was deemed acceptable on that issue so why the change of criteria? With no-one from the RFU bid team still at the RFU, the IRB will move the goalposts." The IRB and ER2015 maintain the initial bid was never binding and refer to the fact that the last two World Cups had standardised pitch sizes.